The trip started off with the usual flight on Air Tahiti Nui. I thought long and hard about upgrading to business class, but I ended up having a row of two seats to myself on both legs of the journey. A rare treat indeed! The new interiors of the Air Tahiti Nui fleet are colorful, comforting, and modern. However, in my honest opinion, I didn’t really notice a huge difference, at least in economy. The business class updates are truly the ones that stand out, with 160 degree pitch and hard shells around the seat for privacy. It’s a pricey venture to fly business class, but I do recommend it if you can swing the ~$4000/ticket going rate. Upon arrival, we had a lovely meet and greet and were shuffled off to the ferry terminal. The ferry terminal was a new experience for me, as I have always flown over to Moorea. We had a little bit of a wait for our particular boat, but the open air terminal was a good place to sit, have some coffee or a snack, and “wake up” from the 8 hour flight. One slight annoyance with the ferry is that a gentleman claiming to represent Moorea Tourism gave an introductory speech on the island. At first, it seemed unbiased and helpful, but then it quickly turned into a pitch for several of the activity operators. If it included ALL of the businesses on Moorea, that would not be so bad. But, this was clearly a sales pitch for his company and affiliates. If you happen to come across this, feel free to listen and take the brochure, but keep your options open. The ferry ride to Moorea was a quick, yet slightly choppy, 30 minute ride. I typically do not get sea sick, but the water was particularly active and I felt it best to just sit and focus. So, just a warning for those who tend to not deal well with motion. Upon arrival, we were met by our transfer and driven to the hotel, which was no more than 5 minutes down the road. Sofitel Ia Ora Resort and Spa- The Sofitel Ia Ora is located between the ferry port and airport and faces the main island of Tahiti. The view of Tahiti, along with a protected lagoon and long stretch of white sand beach, are what make this particular resort unique. The resort is a blend of modern chic and authentic Polynesian decor which is seen in all of the Sofitel French Polynesia properties. The property stretches along the beachfront with the main road perched above, so noise is not an issue. The lobby, pool, restaurants, and spa are centrally located on the property, making it easy to access from any point on the property. Both restaurants- the more casual Pure and the gourmet K, offer delicious meals in settings that reflect the Polynesian atmosphere. Pure, located adjacent to the bar, has amazingly large portions. K offers a romantic dinner with an intimate dance show, where you can enjoy your meal with your toes in the sand. The rooms on the property are categorized by location- garden, lagoonview, beach, or overwater. All of the bungalows have similar interiors, but come in two sizes. The garden and beach bungalows are the same size, while the lagoon and “superior” overwaters are slightly smaller. The “luxury” overwater bungalows, which are the top category, are slightly larger than the garden and beach bungalows due to a larger terrace. While the luxury overwater bungalows are the crowning jewel of the property, all of the bungalow options have their unique perks, so do not hesitate to stay at this property even if you have budget limitations. While on Moorea, we also had the opportunity to do several excursions that were arranged by the resort. These are the same excursions offered to my clients- so lucky you! We were fortunate enough to experience Moorea by jet ski, 4×4 ATV, and by boat! We started off with the jet ski tour, which took us from the Pearl Resort to an area just past the InterContinental Resort. Along the way, we stopped at Cook’s Bay and Opunohu Bay to enjoy the scenery and get a quick history lesson. We also stopped briefly along the coast to view an underwater tiki garden, which has various statues placed amongst the coral that are best viewed by snorkeling around the area. The tour’s last stop was at a ray feeding area, where there very friendly (and barb-less) rays swim up to you while being fed by the tour guides. After the jet ski tour, we turned our sights to the gorgeous interior of Moorea. 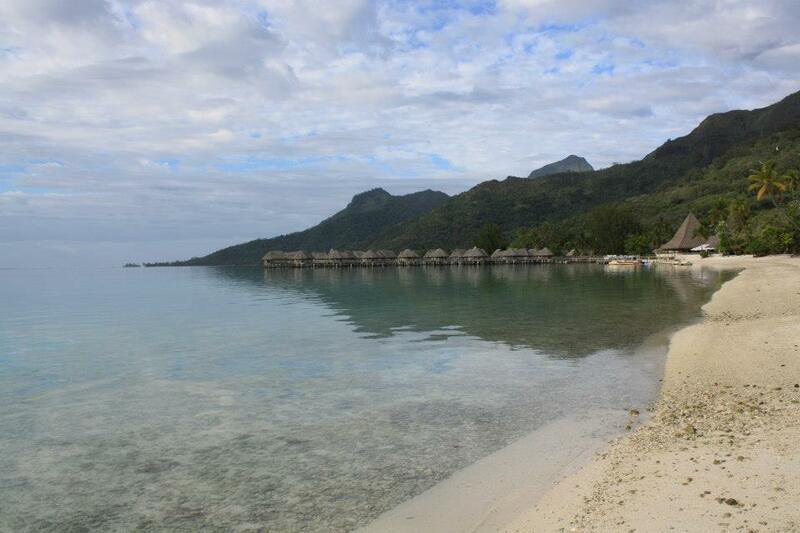 Moorea is known for its stunning peaks and views overlooking the two bays. The ATV tour takes you through the pineapple fields, valleys, and up to Belvedere Lookout to enjoy the captivating views. You also get the chance to stop at the agriculture school to sample some homemade jellies and juices. On the return, you also venture up “Magic Mountain”, which is unbelievably steep, yet rewards you with more stunning views at the top. While the tour was definitely worthwhile, it can be a little agressive, so it’s not for everyone. Our final tour in Moorea was the Lagoonarium. This tour consists of dolphin watching and snorkeling in a coral garden just off of a tiny motu. We were very fortunate to see many dolphins on our tour! I had never seen them on previous trips, so this was quite exciting for me. The snorkeling off of the motu was fun, though it does mostly consist of holding onto a rope and watching the abundant sea life around you. You will see many rays, fish, and even some sharks! After you snorkel, you can take a seat on the motu to dry off and enjoy the sun. Following our lovely stay in Moorea, we flew Air Tahiti over to Raiatea to catch the shuttle boat to Le Taha’a Island Resort. Words cannot describe how giddy I was as we arrived at the resort. The resort has not changed much since my previous trips with the exception of an extended fitness center. While not extremely large, the fitness center is modern and spacious. I also must note that while I still firmly believe there is no such thing as a bad room category at this resort, the sunset view overwater bungalows received an amazing show during our stay. The sunsets were amazing, with shades of pink, red, and orange that I did not know were possible. So, if you are someone who appreciates a good sunset, these rooms are worth booking. Typically, when at Le Taha’a, I tend to keep to myself and just enjoy the beauty of the resort. However, we were given the opportunity to do a land/sea exploration tour that was just fantastic! It’s a great way to see the main island of Taha’a and experience what the island has to offer. The tour can be done as a group or privately and consists of a pearl farm visit, vanilla plantation visit, shark and ray feeding, and motu picnic. The motu picnic was fanastic! Just try to imagine sitting in the middle of paradise, waist deep in the crystal blue waters, toes in the sand, and enjoying a feast of Polynesian specialties! Quite a vision, huh? For what it’s worth, my favorite treat was the coconut bread. Our stay at beautiful Le Taha’a was short and after a lovely poolside lunch, we were on our way back to Raiatea. Next up- Bora Bora!! While Bora Bora is considered to be the crown jewel of French Polynesia, I will say that I think all of the islands are stunning and unique. However, there is certainly an special and magical feeling you get when you land at the Bora Bora airport and take in the surroundings on your boat shuttle to your resort. Some of the best resorts in the world are located in Bora Bora, all different and all with a special appeal depending on what type of experience you are looking for. As I was hosted by Sofitel, we spent two amazing evenings at the Sofitel Bora Bora Private Island. The resort is the smallest and most intimate on the island. It’s a true hidden gem, though I’m certainly trying to get the word out about this special place. The views are amazing and the resort is built into a hill, so you can see out beyond the other resorts, out toward the vast colorful lagoon. The rooms consist of hilltop suites, overwater bungalows, and a villa. The hilltop suites are great for those who want the views but can’t afford the overwater experience. The villa is for those who want the views and an extremely private experience. The rooms will be undergoing a renovation in 2014 and the remainder of the resort was renovated prior to my stay. Everything about this resort is private, though, as the name suggests. In addition to the impeccable service, the resort goes above and beyond by offering a truly unique romantic evening under the stars, that starts with sunset champagne and canapés, followed by dinner on the beach with a special Polynesian dance performance. The Private Island also boasts one of the best onsite snorkeling areas in all of Bora Bora. You can simply take a kayak out around the island and explore at your own pace. You can also venture over to the Sofitel Bora Bora Beach Resort, just across the lagoon. There is an on demand boat shuttle, which makes the 5 minute journey extremely easy. The Sofitel Bora Bora Beach Resort has more restaurant choices, as well as a pool, and is in general a bit more lively. It’s a 4 star option and provides the budget minded traveler an escape to Polynesia at a palatable price. The overwater bungalows are always the most popular, but check out the beach bungalows at this resort. You will feel like you have your own private stretch of beach to explore. Not to be outdone by the tour we took in Taha’a, we were blessed with another amazing tour in Bora Bora. The tour was lead by Moana Tours, which works directly with Sofitel Private Island and the Four Seasons Resort. Moana offers both group and private tours, ranging from a simple snorkeling trip to a customized circle island tour. Your boat driver and guide will serenade you with local music while you take in the sights. Our tour consisted of a shark and ray feeding, coral garden snorkeling tour, a private motu picnic, and boat ride around the main island. While our stay was too short in Bora Bora, our trip wouldn’t be complete without our stop in Rangiroa. I had previously visited Hotel Kia Ora Rangiroa in 2006, prior to their major renovation project. Rangiroa is an atoll- the second largest in the world!- and is a part of the Tuamotu archipelago. Atolls are flat and Rangiroa is no exception, making it a little easier to explore by bicycle. The lagoons are almost to picturesque to be real and the island is a diver’s paradise. If nothing else, come to Rangiroa for the diving, snorkeling, or fishing. Fortunately for the luxury traveler, the Hotel Kia Ora is a quiet hideaway, with overwater bungalows, beach bungalows with Jacuzzis or plunge pools, family beach and garden villas, as well as garden villas with plunge pools. The beach bungalows with plunge pool are the highly coveted room category, though the garden villas are a close second. What makes the garden villa so attractive is that the private outdoor space is just as large as the bungalow itself! In addition, Hotel Kia Ora has an amazing infinity pool that seems to blend right into the lagoon, an overwater bar (where you can sip wine from Rangiroa’s very own vineyard! ), and a spa. So, you can choose to laze about the resort or explore the island on one of the many activities the resort arranges daily. Of course, diving is the top draw, but one of the most popular non-diving activities is the Tiputa Pass drift snorkel. I have written about this before, but the drift snorkel is a MUST while staying on Rangiroa. It is tide dependent, but well worth the effort to arrange your schedule around it. Our time in Rangiroa was very short and we capped off our stay with a visit to the Radisson Tahiti on the main island (NOTE: The Radisson is now the Tahiti Pearl Beach Resort). The Radisson is a bit of a journey from the airport, and not exactly Polynesian in style, but it’s a great hotel for those looking to spend a little time on the main island away from the hustle and bustle. Plus, it has a black sand beach, which isn’t something you will see on the surrounding islands. After a lovely hosted dinner at the Radisson, we had to head to the airport for our flight home. It’s always sad to leave the islands and every time I go, I hope that it won’t be the last. There is something about Tahiti and her islands that stays with you and that is why I am so passionate about assisting people with planning their dream vacations there. So, until the next review! Additional photos of French Polynesia can be seen on the Tahiti Information tab.